I can’t stop talking about Fyre Festival. I know the scam occurred over a year ago. (If you aren't familiar: In 2017, people shelled out serious cash for a "luxury" festival in the Bahamas, only to show up to a site with FEMA tents, no power, and no water.) Trust me—I couldn’t stop talking about it then, too. But the release of not just one, but two documentaries about the scam of the century has it at the top of mind once again. When I watched the docs over the weekend, of course I chuckled at the cheese sandwiches billed as "gourmet" food and ached for the residents of Exuma, Bahamas, who were conned out of their savings. But, like many people, I also kept thinking: What as going through organizer Billy McFarland’s head? How did he simply ignore the warning signs—and, wow, were there many—that the festival just wasn't going to come together in time? Why wasn't he worried? While McFarland seemed immune to any sort of stress as the festival inched closer, so many of us can get overwhelmed by even just small day-to-day worries. They can even pile up and transform into a worry spiral—that thought pattern that starts with one worry and fully evolves into a flurry of anxiety that feels totally out of your control. The truth: Some forms of worry are useful—they can protect us from danger and signal when it's time for us to take action (like, when you should cancel that music fest). But other worries? They can just cause us to spin our mental wheels for no reason. Some forms of worry are useful—but other worries? They can just cause us to spin our mental wheels for no reason. Recognizing what type of worry is and isn't useful is key—and that's something New York Times bestselling author Sarah Knight has a tried and true solution for. For Knight, it's all about stepping back from her worries and asking herself it's probable to happen. “Focusing on the probability of occurrence is a huge simple way for me to be able to shift my way of thinking," Knight told Shine. In the same way we categorize hurricanes or natural disasters, we can categorize the probability of our worries actually happening with what Knight calls a probometer. It’s a no frills way to take stock of the worries on your plate and decide how much of your resources—what Knight calles "freakout funds" aka time, money and energy—you’ll put into worrying about them. Imagine a speedometer. That’s exactly what Knight’s "probometer" looks like—except instead of miles per hour, it’s divided into five categories. Say you’re worried about slipping on ice today and falling in public. It’s a very real feeling but if you're wearing snow boots? Highly unlikely. A Category 2 worry, on the other hand, could be that you forget everything about that presentation you’re supposed to give at work today. That’s "possible but not likely" because, well, you put together the presentation—you know your stuff, and you’ve never flubbed that drastically before while giving one. On the flip side: A Category 5 is something that will inevitably happen—unless you can do something to avoid it (see: canceling the Fyre Festival), it still might not be worth your stress. If there's nothing you can do? Knight says it's OK to release the worry and save your energy for more actionable things. “If it’s inevitable and there’s nothing I can do about it, maybe I should stop worrying about it until it happens,” Knight explained. Knight’s probometer isn’t about eliminating worries altogether, though. Instead, she calls the visualization a tool to help you manage the likelihood that those worries will happen or not. 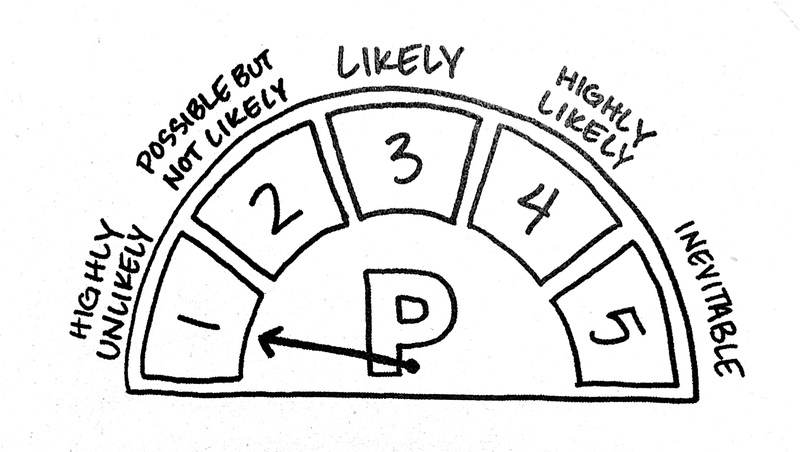 It’s all about probability and determining ways you can spend your time, energy, and money more productively. You can get started using it soon as now. What’s a worry that’s been plaguing your brain lately? Take a quick moment to categorize it within the 1-5 probometer range. If it’s a 1, consider dismissing it because the likelihood of it happening is too low. If it’s a 5, consider how much time and energy you are willing to spend on it—and if that energy is even worth spending in the first place over something you may not be able to control. While it's too late for the Fyre Fest crew, it definitely isn’t too late for you to learn which types of worry are helpful and which ones you can shake off.